I’m a fly by the seat of my pants kind of cook, so I quite literally threw this recipe together in 2 hours, from concept to the table. I have to pat myself on the back because these chili boats came out AMAZING!! It satisfied every craving you could think of, and while it’s hearty and has a complex flavor, it’s also light enough to leave you feeling energized and healthy. 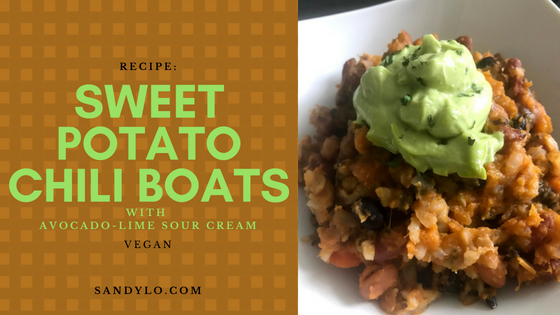 This is the perfect meal for a dinner party, especially for the upcoming fall, as sweet potatoes and chili seems to warm people up and make them feel festive. 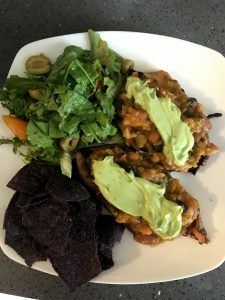 Sweet Potato Chili Boats paired with a light salad and blue corn tortilla chips. Step 1: Wash sweet potatoes and slice in half. Place in microwave for 15 minutes or bake in the oven until soft. Scoop out insides of potatoes and set aside. Heat the oven to 400 degrees. Step 2: In a large pot over medium heat, melt Earth Balance butter and add onions, garlic, and celery to the pot. Let cook, stirring occasionally until the onions and garlic get soft. Add carrots, sliced tomatoes, and eggplant and continue to stir. Let simmer a few minutes. Step 3: Drain cans of beans and stir them into the pot. Stir in rice. Add vegetable broth, salsa, and tomato sauce and stir. Let simmer a few minutes. Step 4: Add broccoli and sweet potato insides into the chili and stir. Step 5: Season your chili with salt, pepper, cumin, and cayenne… making it as flavorful and spicy as you’d like! Be careful – as the flavors set in, it will get stronger. Less is more – you can always add to it later, but you can’t take away! Step 6: Finally, add the Spanish olives to the chili. Continue to cook the chili on a low flame, stirring occasionally for the next 30 minutes while you prepare the sweet potatoes and sour cream. Step 7: Grease the bottoms of the sweet potato skins with Earth Balance and place on a baking sheet in the oven. Cook until edges are getting crispy. Step 8: In a blender or food processor, throw in all of the ingredients for the avocado-lime sour cream, minus the parsley/cilantro and blend until smooth and creamy. Garnish with parsley or cilantro.